Peterborough Northern Star celebrate their winning goal at March Town. Photo: Chantelle McDonald. @cmcdphotos. Netherton United’s FA Vase adventure will continue for a few more days. The city side entered the competition for the first time this season and their debut match ended in a very creditable 1-1 draw at higher-level Potton today (September 9). Matt Barber in action for Peterborough Northern Star at March Town. Photo: Chantelle McDonald. @cmcdphotos. Ashley Jackson equalised for Netherton who played the final 12 minutes of normal time and a full 30 minutes extra time with 10 men following the dismissal of Ben Daly for two yellow cards. Callum Madigan’s own goal had given Potton an early lead. The replay takes place at the Grange on Wednesday (September 13). Peterborough Northern Star are awaiting the winners of that replay in the second qualifying round after winning a thriller at March. Star looked to be cruising at 2-0 thanks to two goals from Zak Munton, one of which came from the penalty spot. But a red card for Christan Gordon while conceding a penalty gave March a lifeline. Jack Flintoft celebrates his winning goal for Peterborough Northern Star at March. Photo: Chantelle McDonald. @cmcdphotos. Michael Chow converted the spot-kick before Dayne Moore levelled, but Jack Flintoft muscled his way past a couple of defenders to net a late winner for Star. Bourne also won a five-goal thriller. The United Counties Division One team pipped Premier Division Harborough thanks to an extra-time winner from Jezz Goldson-Williams. 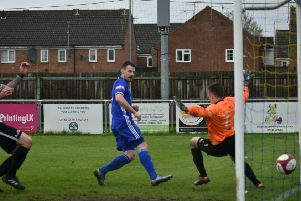 There was a flurry of late goals in this one as Jack Humphries and Robbie Pearce fired Bourne into a two-goal lead only for Harborough to score twice in the final four minutes to take the tie into extra time. Holbeach delivered a second-half super show to beat local rivals Pinchbeck in a Friday night tie 5-1. All the goals arrived after the break following a first 45 minutes shaded by the underdogs. Mitch Griffiths, Joe Braithwaite, Charley Saunders, Jordan Keeble and George Zuerner scored the goals. Blackstones were beaten 5-1 at Histon. First Round Qualifying: Bourne Town 3 (Pearce, Humphries, Goldson-Williams), Harborough Town 2; March Town United 2 (Chow, Moore), Peterborough Northern Star 3 (Munton 2, Flintoft); Fakenham Town 2, Huntingdon Town 3; Histon 5, Blackstones 1; Pinchbeck United 1 (Shipley), Holbeach United 5 (Griffiths, Zuerner, Braithwaite, Sanders, Keeble); Potton United 1, Netherton United 1 (Jackson).